Like most complex tasks, .NET programming is fraught with potential costly, and time-consuming hazards. The millions of Microsoft developers worldwide who create applications for the .NET platform can attest to that. Thankfully there's now a book that shows you how to avoid such costly and time-consuming mistakes. It's called .NET Gotchas. 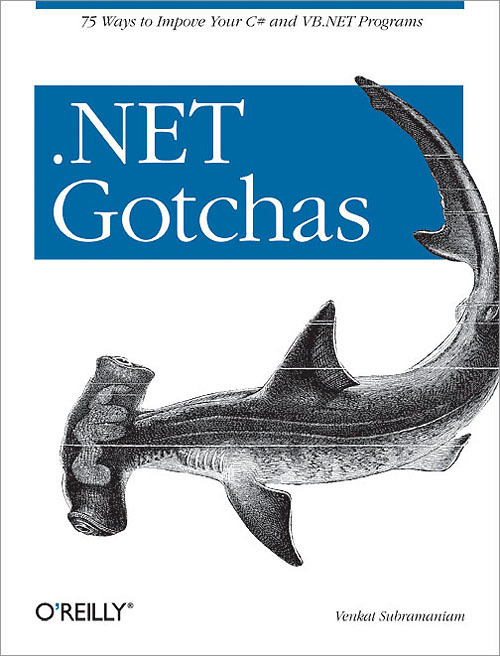 The ultimate guide for efficient, pain-free coding, .NET Gotchas from O'Reilly contains 75 common .NET programming pitfalls-and advice on how to work around them. It will help you steer away from those mistakes that cause application performance problems, or so taint code that it just doesn't work right. The book is organized into nine chapters, each focusing on those features and constructs of the .NET platform that consistently baffle developers. Within each chapter are several "gotchas," with detailed examples, discussions, and guidelines for avoiding them. No doubt about it, when applied, these concise presentations of best practices will help you lead a more productive, stress-free existence. What's more, because code examples are written in both VB.NET and C#, .NET Gotchas is of interest to more than 75 percent of the growing numbers of .NET programmers. So if you're a .NET developer who's mired in the trenches and yearning for a better way, this book is most definitely for you. Dr. Venkat Subramaniam (venkats@agiledeveloper.com) is the founder of Agile Developer, Inc. (a software training, mentoring and development firm), and a co-founder of DuraSoft. Working with .NET since its Beta 2 pre-release, he's used the platform extensively on commercial projects for his clients. Venkat offers several courses on developing applications using .NET, and has trained and mentored more than 3,000 software developers in the US and Europe. A frequent speaker at software development conferences, he is also an adjunct professor for the practice of computer science at University of Houston, and teaches at Rice University's School for Continuing Studies. Venkat holds a BS in Computer Engineering, an MS in Electrical Engineering, and PhD in Computer Science. He is recipient of the 2004 UH Computer Science Department Teaching Excellence award. View Venkat Subramaniam's full profile page. GOTCHA #43 Using new/shadows causes "hideous hiding"